Jagannath Puri is one of the four holy “dhamas”, sacred places of pilgrimage, described in the Puranas and is visited by thousands of Hindus on a daily basis. The Brahma and Skanda Puranas mention that city of Puri itself was built-in ancient times by Raja Indradyumna. It is most famous today for the ancient temple of Lord Jagannath, His elder brother Baladev, and His sister Subhadra. This temple was built by the Rajas of Kalinga and Utkala (ancient names of present day Odisha), situated in East India on the bank of the Ganga Sagara (literally “Ocean of Ganges water”). prominent pastimes at Puri was to personally place the body of Haridas into a samadhi on the ocean shore. For these reasons, Puri holds special importance for his followers, the Gaudiya Vaishanvas. Srila Bhaktivinoda Thakur was posted as a Government Officer at Puri around 1870. It was here that his son, Vimala Prasad, who was to become Srila Bhaktisiddhanta Saraswati Thakur was born. 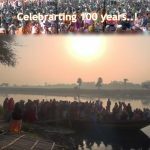 And his disciple, ISKCON Founder-Acharya Srila A.C. Bhaktivedanta Swami Prabhupada expressed the desire that a grand center of ISKCON be established at Puri. 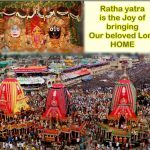 The annual Jagannath Rathayatra festival (chariot festival), observed on the aashaadh shukla dvitiya (second day of the fortnight of the waxing moon in the Hindu month of aashadh) draws more than a million (ten lakhs) pilgrims to Puri. Sri Chaitanya Mahaprabhu attended the annual festival during his presence five hundred years ago. Srila Prabhupada instituted this festival around the world. 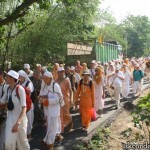 Nowadays this festival has become synonymous with ISKCON, almost everywhere! 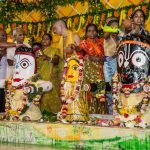 While the struggle for foreign devotees to enter the temple of Jagannath continues, it is a fact that despite the continued ban on entrance, thousands of foreign ISKCON devotees visit Jagannath Puri regularly. To date ISKCON does not have a proper center to facilitate these devotees visits to holy Jagannath Puri dham. Purushottam Swami, ISKCON’s Governing Body Commissioner for much of Eastern India, including his native Odhisha (formerly “Orissa”). Seven to eight thousand devotees, mainly from Bengal and Orissa, but also from other parts of India and abroad attended this years Puri Parikrama. Teachers and students of the Bhaktivedanta Academy at Sridham Mayapur performed the bhumi puja rituals. Headed by the Academy Dean Pritivardhana Das, the boys performed homas to satisfy Lord Jagannath. Later on Krishna Chaitanya Das assisted Lokanath Swami in the installation of the Deity of Ananta Shesha, the expansion of Lord Vishnu who is the supporting power holding up the universe, in the ground where the foundation of the Radha Krishna temple will be constructed. Twelve ISKCON sannyasis attended the bhumi puja, i.e. Jayapataka Swami, Lokanath Swami, Subhag Swami, Bhakti Purushottam Swami, Bhakti Vishrambha Madhava Swami, Bhakti Gaur Narayan Swami. Gauranga Prem Swami, Bhakti Nityananda Swami, Rama Govinda Swami, Prabodhananda Saraswati Swami, Bhakti Ashray Vaishnav Swami, and Bhakti Priyam Gadadhar Swami. Several senior disciples of Srila Prabhupada attended the program, i.e. Turiya Das, Pankajanghri Das, Mayapur Chandra Das, Bhaktarupa Das, Basu Ghosh Das, Shakitmati Devi Dasi, Kusha Devi Dasi and Shubhangi Devi Dasi. Senior ISKCON devotees Braja Hari Das, Bhadra Charu Das, Aravindaksha Govinda Das Madhavananda Das, and Vanamali Das were in attendance. Bhakti Purushottam Swami spoke and described to the assembled devotees about the glories of Lord Jagannath’s Mahaprasadam. 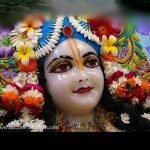 He explained in great detail why the Lord’s prasadam is offered to the Deity of Vimala (Durgadevi) after being offered to Lord Jagannath. Devakinandan Das, the Chairman of the Puri Project Committee, which has been mandated by the ISKCON Governing Body Commission as the zonal authority for the Puri Project, addressed the crowd in both Hindi and English and encouraged them to support the project. Bhadra Charu Das translated his speech into Bengali and Oriya. Jayapataka Swami and other senior devotees on the stage released the large version of the Project brochure – a separate pamphlet was also released – detailing the various aspects of the proposed project. Jayapataka Maharaj himself told the crowd that Srila Prabhupada had a desire to construct a large temple and project at Puri and now that desire of his will be fulfilled. And guests pledged almost a million rupees (Rupees ten lakhs) towards the project on the spot. Those who are interested to donate for the project or donate for a residence in the bhakti nivas, where one, two, and three bedroom/hall/kitchen facilities are to be constructed may contact Puri Project Director and Temple President Vanamali Das via e-mail at <puriiskcon@gmail.com>, or <vanamali.jps@pamho.net>, or contact him over the phone: +91-94370-65008. Additionally, the ISKCON Puri Project is already operating a guest house to facilitate ISKCON devotees and life patrons. The ISKCON Puri Project guest house is situated in a new building located just off the main Chakratirtha Road, behind the Purushottam Vatika on road near the Urban Hatt to Railway station road. Nearby the Puri Railway station, which is only half a kilometer from the guest house. Eighteen rooms are available, and all rooms have split air conditioners, and wi-fi internet. All the rooms have attached bath rooms with hot water. The project has already begun a Govinda’s Restaurant. This fully air conditioned restaurant, is situated on the main Chakratirtha Road at Banki Mohan, not far from the Mayfair Hotel, and the Subhash Bose Statue. Govinda’s runs on “alacarte” system. Life Patrons can avail 20% discount at Govinda’s.